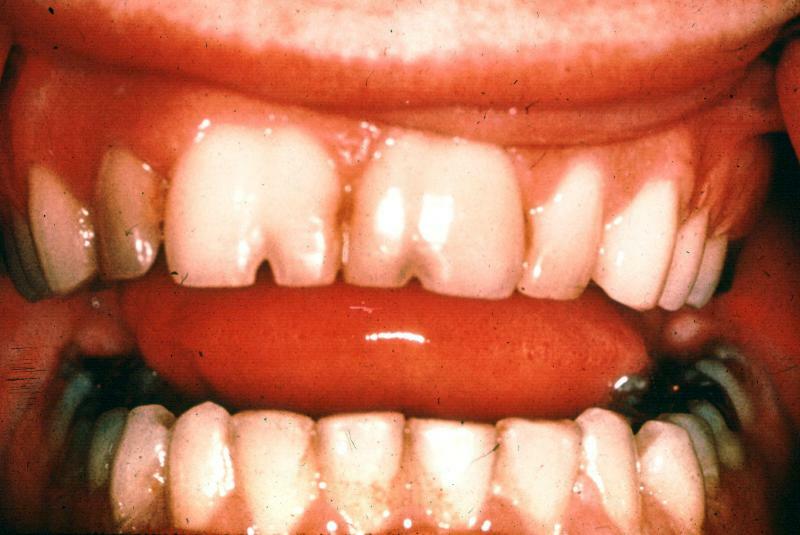 The term microdontia means 'small teeth'. True microdontia can be differentiated from relative microdontia associated with macrognathia (teeth of normal size in a larger than normal jaw) by referring to a table of average values (such as Linek's Tooth Carving Manual). 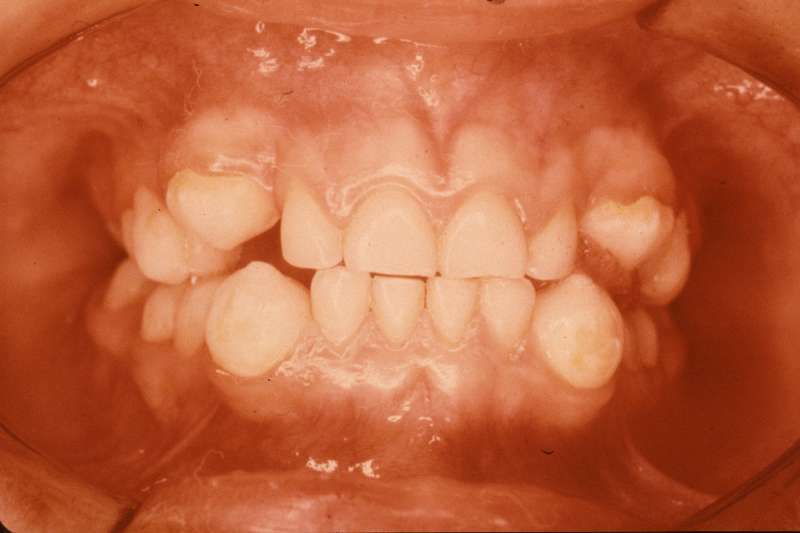 Microdontia may occur as a single entity in a normal dentition or it can be associated with syndromes such as Down syndrome and pituitary dwarfism. The radiograph on the left is an example of a microdont secondary (permanent) canine (courtesy of Drs. Steve Ahing and John Perry, University of Manitoba). The average length of a permanent mandibular canine is 27.5mm (Goodacre, CJ, 2003) while the average length of the mandibular lateral incisor is 23.4mm. The lateral incisor is normal in length. 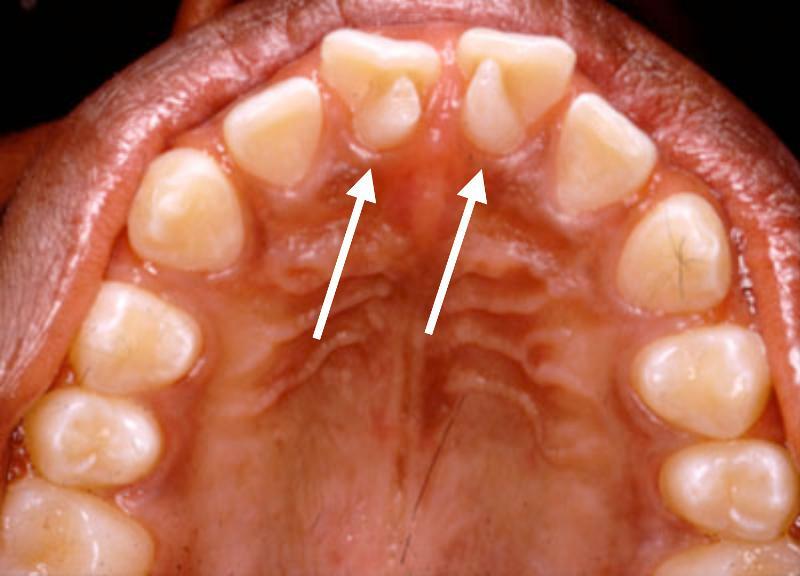 The clinical photo on the left shows microdont secondary (permanent) mandibular central incisors (courtesy of Drs. Steve Ahing and John Perry, University of Manitoba). Both mandibular central incisors have conical-shaped crowns. The patient in the clinical photo on the left has a peg lateral incisor (permanent maxillary left lateral incisor). The maxillary arch has been banded to regain lost space due to this microdont tooth. The goal is to create enough space to restore the peg lateral to its normal size and shape and to match the permanent maxillary right lateral incisor in size, shape and colour (courtesy of Drs. Steve Ahing and John Perry, University of Manitoba). The term macrodont means "big or large tooth". It is extremely rare to have generalized dentition of macrodont teeth. The incidence of macrodontia is approximately 1% of the population . Macrodontia must be differentiated from gemination (one tooth bud attempting to split into two teeth) and fusion (two teeth joined with separate root canal systems) . Macrodontia may be associated with a growth disorder or with syndromes such as pituitary gigantism. The clinical photo on the right shows two permanent maxillary canines (courtesy of Drs. Steve Ahing and John Perry, University of Manitoba). The canine on the left is of normal length (approximately 27mm). The canine on the right is a macrodont due to its abnormally length (approximately 35mm). Booth published a case report of a patient with a maxillary canine that was 41mm in length (Booth, JM, 1988). The patient reportedly was a 5'2", 31 year old female of Dutch origin. The canine on the left is of normal length (27mm). The canine on the right is a macrodont. The clinical photo on the left illustrates a macrodont permanent mandibular second premolar (mesial view). The average overall length of a mandibular premolar is 23.2mm (Goodacre, C, 2003) and is illustrated on the left. The macrodont on the right has normal crown dimensions and an abnormally excessive root length (courtesy of Dr. BM Cleghorn, Dalhousie University). These teeth are characterized by having prominent marginal ridges associated with a deep lingual fossa on the maxillary incisors. This gives the crown of the tooth a shovel-like shape, hence the name. Shovel-shaped incisors may be associated with dens invaginatus. This would be considered an anomaly in some populations such as Caucasian populations but normal in Eastern Asian populations like the Japanese and North American Native populations, where this is very common. The incidence is approximately 15% in North American Caucasians (anomaly) in contrast to close to 100% in Asians and North American Aboriginal populations (normal in these populations) . 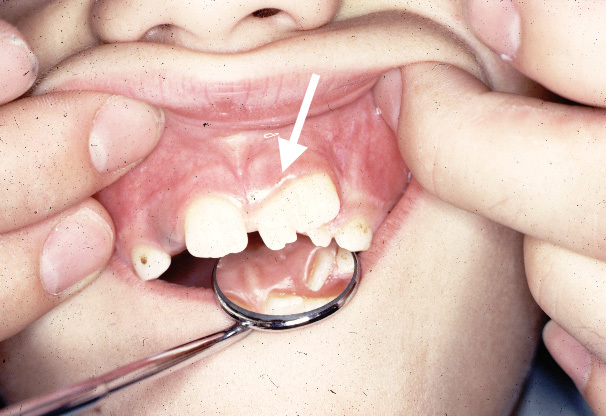 Shovel-shaped incisors may be associated with syndromes such as Klinefelter's syndrome (extra X chromosome in males) and can also be associated with taurodont teeth or can be an isolated feature in the dentition. 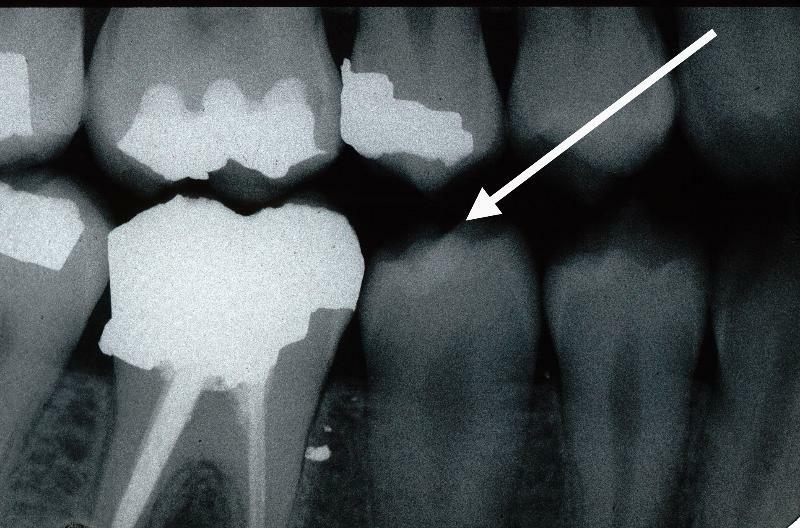 The clinical radiograph (below) shows shovel-shaped secondary maxillary right central and lateral incisor (courtesy of Dr. BM Cleghorn, Dalhousie University). This is a condition where there is enamel projecting on root surface that is continuous with the enamel of the crown. This is more commonly found in mandibular molars in the buccal furcation region. This should be differentiated from an enamel pearl because a pearl is a separate elevation of enamel on the root while the cervical enamel extension is enamel continuous with the enamel of the crown of the tooth. The incidence ranges from 8.6% to 32.6% in all populations but is more common in Asian populations. Clinically, this condition may lead to periodontal pocketing due to a lack of periodontal attachment to the enamel. The image to the right illustrates an enamel spur on a secondary (permanent) maxillary first molar. This is a condition of ectopic enamel that is separate from the enamel of the crown. This entity can be differentiated from a cervical enamel extension because of its separation from the enamel of the crown of the tooth. The incidence of enamel pearls is 1.1 to 9.7% in all populations but the highest incidence of enamel pearls occurs in Asian populations. If the pearl is large, an extension of the pulp may be involved. 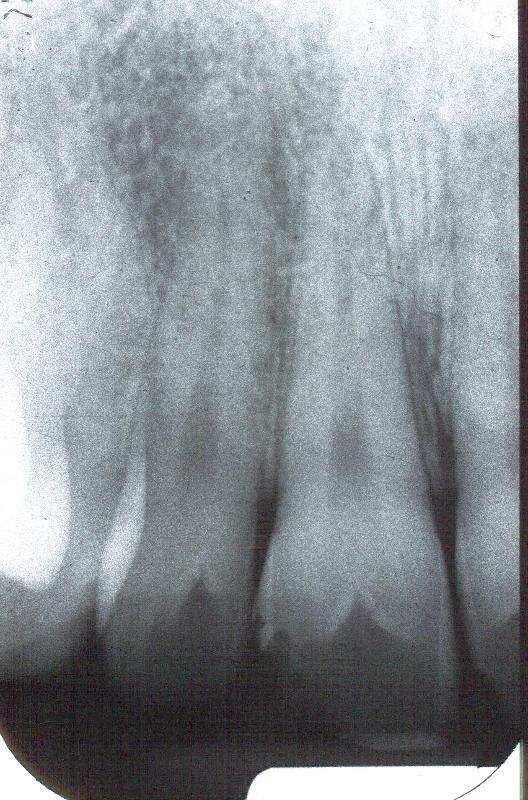 Radiograph of extracted maxillary third molar with two enamel pearls on the root (courtesy of Dr. BM Cleghorn, Dalhousie University). 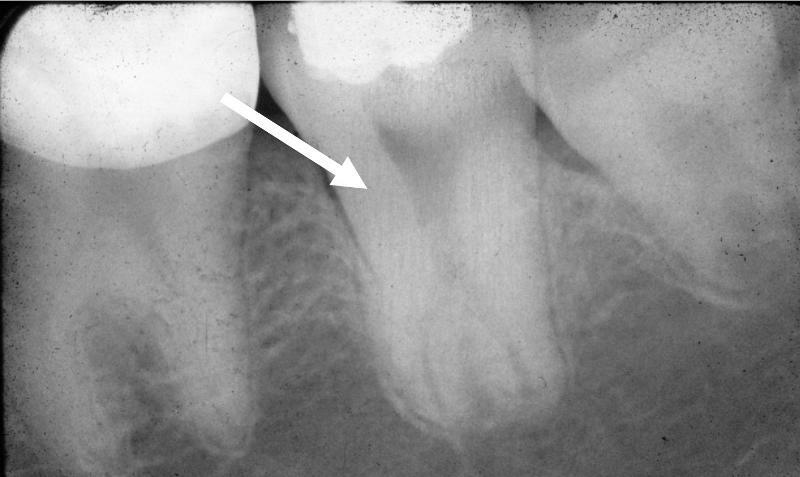 This is defined as an invagination along the root surface of a tooth . Problems associated with radicular grooves include periodontal pocketing due to a communication with the oral cavity and if severe, communication with the pulp. The clinical photo (right) is of an extracted secondary (permanent) maxillary right central incisor (lingual view); an endodontic access opening had been attempted prior to its extraction (courtesy of Drs. Steve Ahing and John Perry, University of Manitoba). This is a form of dens evaginatus and presents as an extra cusp usually found on the lingual of maxillary central and lateral incisors. Talon cusps have also been reported on the labial surface of teeth but this is less frequent. Talon cusps can contain an extension of the pulp if the talon cusp is large. The incidence of talon cusps ranges from 0.2 to 5.2% and can be an isolated condition (more commonly) or they can be associated with syndromes such as Rubenstein-Taybi (developmental retardation, broad thumbs, big great toes). This is an occlusal view of the maxillary arch of a 12 year old African Canadian patient with talon cusps on the lingual of the permanent maxillary left and right central incisors (courtesy of Dr. BM Cleghorn, Dalhousie University). Taurodontism is defined as an enlargement of the pulp chamber of multi-rooted teeth (usually molars). This is a normal condition in Neanderthal man and is a normal condition in cud-chewing animals (L. taurus bull and Gr. odous tooth). Short roots and a lack of cervical constriction characterize the teeth involved. It is more common in the secondary dentition and is caused by a later invagination of the Hertwig's root sheath. The incidence ranges from 2.5 to 3.2% in the US population and may occur as an isolated condition (more commonly) or part of a syndrome such as Klinefelter's syndrome, Down syndrome, ectodermal dysplasia or amelogenesis imperfecta. 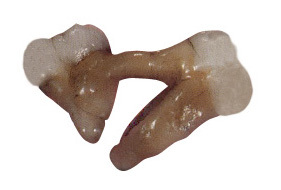 Proximal view of an extracted permanent maxillary right second molar from an Inuit patient (courtesy of Dr. BM Cleghorn, Dalhousie University). This is defined as a sharp angle or bend on the root of a tooth. Trauma or some type of developmental anomaly usually is the aetiology. Aetiology may be an idiopathic or a developmental disturbance. Endodontic treatment or extraction of these teeth may be difficult, therefore, the condition is important to diagnose. Extracted permanent maxillary left central incisor with a short dilacerated root. This was caused by a traumatic injury at the time when the root was just beginning to form. 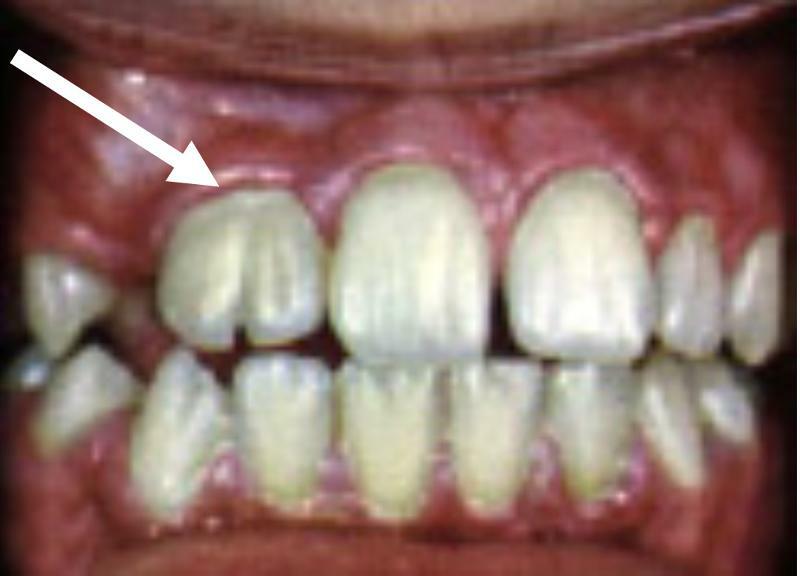 The primary central incisor had been intruded causing the permanent maxillary incisor to have a stunted, dilacerated root (courtesy of Dr. BM Cleghorn, Dalhousie University). 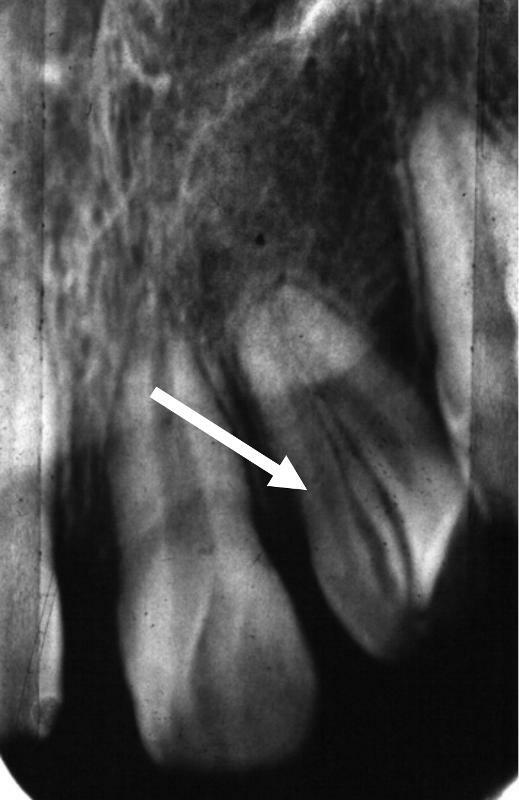 Multiple dilacerated roots on an extracted permanent mandibular left second molar (courtesy of Dr. BM Cleghorn, Dalhousie University). Gemination is defined as the attempt by a single enamel organ to divide into two. The division of the tooth, however, is incomplete. Complete division of a tooth would be called twinning. The incidence of gemination is 0.5% in the primary (deciduous) dentition and 0.1% in the secondary (permanent) dentition. Gemination needs to be differentiated from fusion by counting and identifying the teeth present. 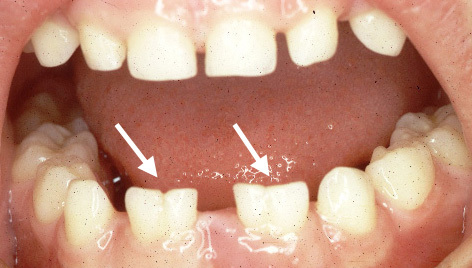 Gemination is associated with a normal complement of teeth. The tooth is a macrodont with a common root canal system. The clinical photo on the left illustrates a permanent maxillary right lateral incisor with a notch in the incisal ridge. 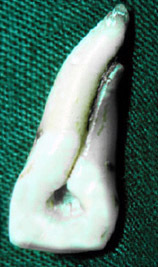 This macrodont tooth has a single root canal system and is an example of gemination (courtesy of Drs. Steve Ahing and John Perry, University of Manitoba). Gemination (courtesy of Drs. Steve Ahing and John Perry, University of Manitoba). The clinical photo on the left illustrates permanent maxillary right and left central incisors with notches in the incisal ridges. 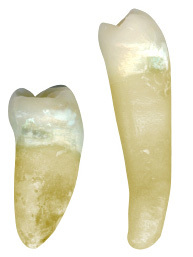 These macrodont teeth both have a single root canal system and are examples of gemination (courtesy of Drs. Steve Ahing and John Perry, University of Manitoba). Fusion is defined as the union of enamel and dentin between two teeth. A differential diagnosis must differentiate fusion from concrescence and gemination. The incidence of fusion is approximately 0.5 % in the primary (deciduous) dentition and 0.1% in the secondary (permanent) dentition. 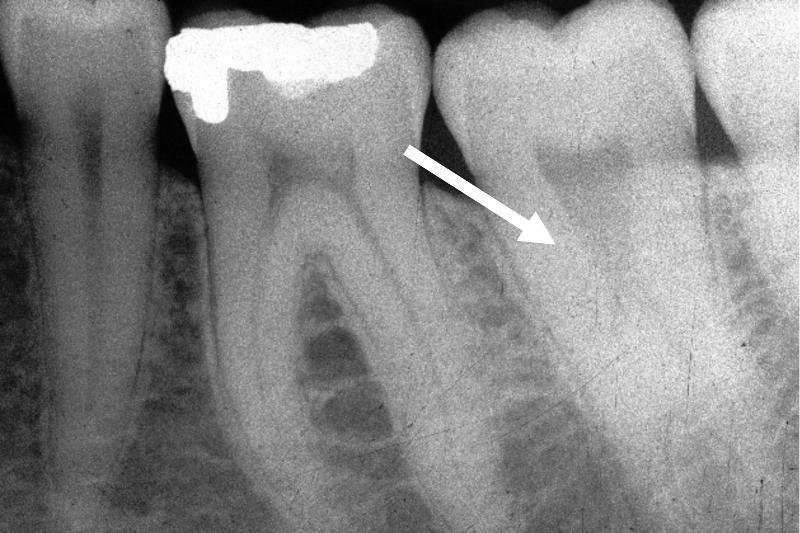 The tooth presents as a macrodont with a separate root canal system (compare to gemination). The total number of teeth in the dentition is reduced by one. The clinical photo on the left is an example of fusion between a permanent maxillary left central incisor and a supernumerary tooth. The permanent maxillary right and left lateral incisors are unerupted. The primary maxillary left lateral incisor and canine are present in this photo (courtesy of Drs. Steve Ahing and John Perry, University of Manitoba). Fusion of the permanent maxillary right central and lateral incisors (courtesy of Drs. Steve Ahing and John Perry, University of Manitoba). The clinical photo on the left is an example of bilateral fusion of primary mandibular incisors. The primary mandibular right central and lateral incisors are fused as are the primary mandibular left central and lateral incisors (courtesy of Drs. Steve Ahing and John Perry, University of Manitoba). The print of the radiograph on the left illustrates fusion between the primary mandibular left lateral incisor and the primary mandibular left canine. 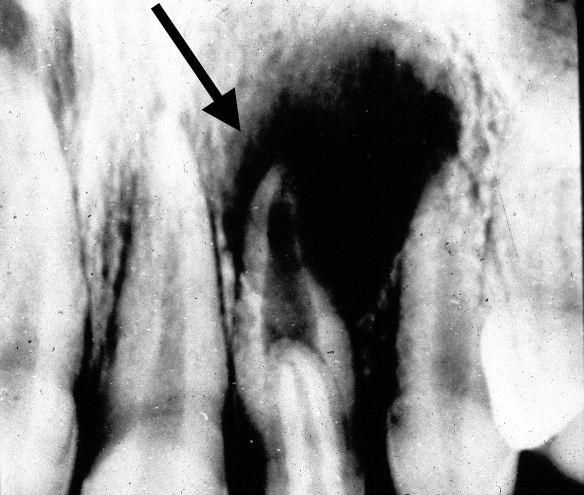 Two separate root canal systems are visible (courtesy of Drs. Steve Ahing and John Perry, University of Manitoba). Concrescence is defined as the joining of teeth by cementum only. It is important to differentiate concrescence from fusion and gemination. Concrescence is caused by a displacement of tooth germs toward each other or due to hypercementosis from trauma after eruption. The photo on the left is an example of concrescence between the permanent maxillary right second and third molars (courtesy of Drs. Steve Ahing and John Perry, University of Manitoba). Differentiating gemination, fusion and concrescence is not always possible due to confounding factors such as the involvement of supernumerary teeth. However, the table to the right provides some basic guidelines that can assist in diagnosis. 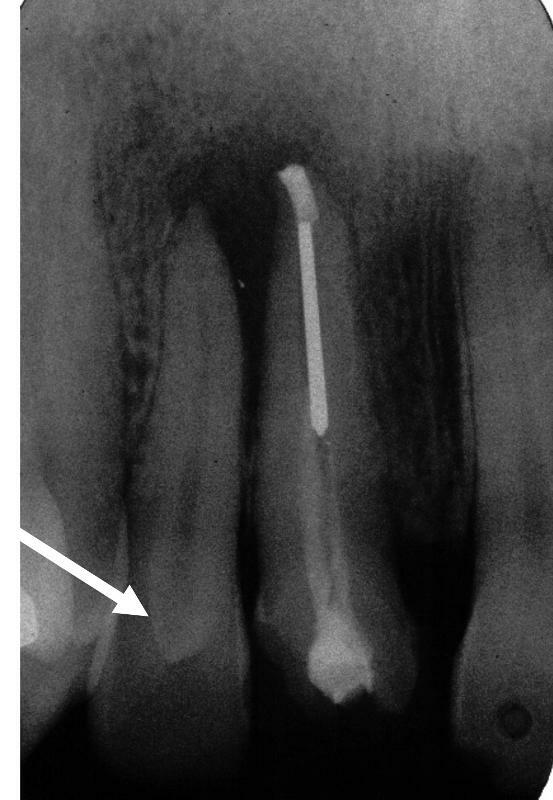 It is important to diagnose anomalous roots when considering extraction or endodontic treatment. This anomaly has ethnic differences and varies greatly among different ethnic groups. Eastern Asian and North American Natives have higher incidences of extra roots on mandibular molars than do Caucasian populations. The clinical photo on the left illustrates a buccal view of an extracted mandibular third molar with accessory root (courtesy of Dr. BM Cleghorn, Dalhousie University). Mesiolingual view of a permanent mandibular left first molar with an accessory lingual root (courtesy of Dr. BM Cleghorn, Dalhousie University). Oehlers classification of this condition continues to be used today (Oehlers, FAC, 1957a, Oehlers, FAC, 1957b and Oehlers, FAC, 1958). Forms include coronal (most common) and radicular type. The incidence ranges from 0.04 to 10% in all populations. "Dens in dente" is a misnomer because it means "tooth within a tooth". This is not really a tooth because it is lined by enamel only appears to be like a tooth radiographically. The severity can range from a pit to a dilated odontome. Treatment can range from restorative to extraction of the tooth. The clinical photo on the left is an example of dens invaginatus associated with the permanent mandibular left first and second premolars (courtesy of Drs. Steve Ahing and John Perry, University of Manitoba). Dens invaginatus associated with the permanent maxillary right central incisor (courtesy of Drs. Steve Ahing and John Perry, University of Manitoba). The clinical photo on the left illustrates dens invaginatus associated with the permanent maxillary left lateral incisor (courtesy of Drs. Steve Ahing and John Perry, University of Manitoba). Dens evaginatus is defined as an outgrowth on the crown of a tooth. Clinically, it appears as a small tubercle on the occlusal surface of a tooth. It may contain pulp if tubercle is large, therefore removal requires careful consideration (such as reduction over multiple appointments to allow for reparative (or tertiary dentin) to form. It is usually located near the central developmental groove or the triangular ridge of a cusp. These tubercles are most commonly found in Asian populations. Occlusal view of a maxillary second premolar with dens evaginatus (courtesy of Dr. BM Cleghorn, Dalhousie University). 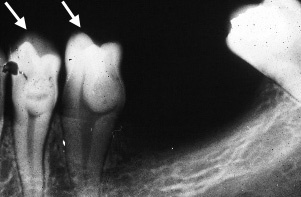 Radiograph of a mandibular right second premolar with dens evaginatus (courtesy of Drs. Steve Ahing and John Perry, University of Manitoba). 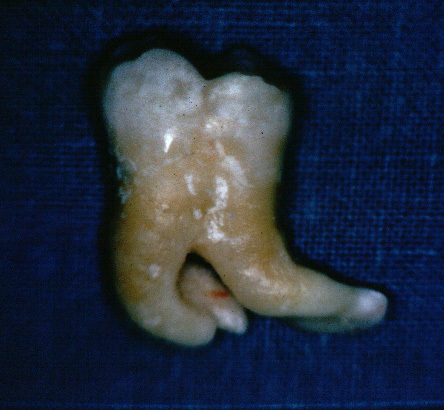 Mesial view of an extracted mandibular left second premolar with dens evaginatus (courtesy of Dr. BM Cleghorn, Dalhousie University). This condition results from congenital syphilis. The effect on the teeth as they are developing produces screwdriver-shaped, notched incisors and molars that have constricted occlusal surface with abnormal occlusal anatomy. The incisors are called "Hutchinson's incisors" and the molars are called "mulberry molars". This condition is not common. Mulberry molars (courtesy of Drs. Steve Ahing and John Perry, University of Manitoba). Hutchinson's incisors (courtesy of Drs. Steve Ahing and John Perry, University of Manitoba). These teeth are rounded and lack cusp ridges and tips. The posterior teeth tend to be globe-shaped.This represent the fusion of growth centres. The teeth usually have multiple root canal systems. Yellow spots on labial aspect of the canines may be present and there may be congenitally missing premolars in the otodental syndrome. Hearing loss is also present. The clinical photos on the right and below left and right are of a patient with globodontia (courtesy of Dr. Igor Pesun, formerly from the University of Minnesota, now at the University of Manitoba). Date last modified: October 10, 2012.